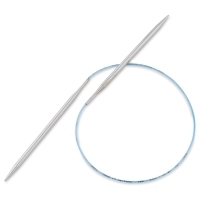 Take your knitting to new speeds with Addi Turbo Rocket Circular Knitting Needles. 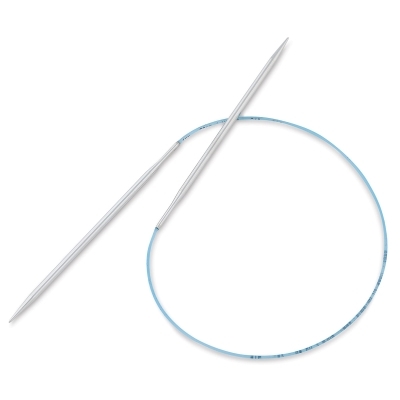 Smooth, snag-free joins and a pliable blue nylon cord make knitting fast and effortless. The lightweight needles feature extra-pointy tips and a slick, nickel-plated brass finish. 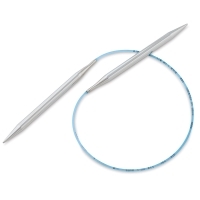 Pick up your stitches with ease and move them along quick as can be. The nylon cable is flexible and strong — it won't coil or kink. 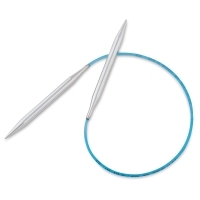 Addi Turbo Rocket Circular Knitting Needles are perfect for knitters who want speed and precision. The needles include a manufacturer's lifetime guarantee. Made in Germany since 1829. Note — Circular knitting needles are measured from tip to tip. For example, a 24" circular needle is 24" from one needle tip to the other. ® addi is a registered trademark.® Turbo is a registered trademark.